A steel plant layout is a mechanism which involves knowledge of the space requirements for the facilities and also involves their proper arrangement so that continuous and steady movement of the production cycle takes place. The general lay out of a steel plant is very important and need highest of the attention in design and engineering phases of a steel plant since once a steel plant construction is over, the basic nature of its layout cannot be changed till the lifetime of the plant. Any modification in the layout at a later date will not only be difficult but will involve a major capital expenditure. The steel plant performance depends on a large scale on its general lay out. Since the layout mistakes are usually permanent and expensive, therefore it is essential that a lot of efforts of engineering should enter into evolving the most suitable arrangements of the facilities. The layout in a steel plant decides the location of different production facilities and communication facilities between the production facilities. It also involves detailed location of equipment and machinery within a production facility. 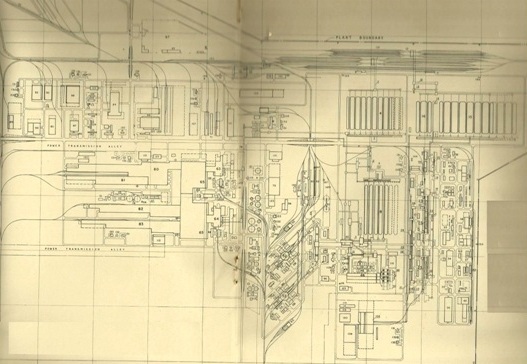 Moore has explained plant layout as,” The plan of or the act of planning, an optimum arrangement of facilities, including personnel, operating equipment, storage space, materials handling equipment and all other supporting services along with the design of the best structure to accommodate these facilities”. As per J L Zundi, “ Plant layout involves allocation of space and arrangement of equipment in such a manner that overall operating costs are minimized. The general layout of a steel plant is the physical arrangement of its production and supporting facilities such as production shops, equipment, machineries, buildings, road, rail and pipe network etc. layout determines the way in which materials and other inputs (such as people and information etc.) flow through the operation. The layout is to be planned to have smooth technological process flow of materials and utilities with least amount of handling from receipt of raw materials to the dispatch of the finished products. It involves judicious arrangement of all the facilities needed for smooth production. Defective planning of layout at engineering stage will lead to inefficiency, inflexibility, large volumes of inventories and work in progress and high operating costs etc. In short the overall objective of designer of the steel plant is to design a physical arrangement which meets the requirements of the end product both quality and quantity wise. It involves allocation of necessary space and allocation of plant and facilities in such a manner so as to have most economical production of the desired products. i) Integration – A layout must integrate of men, materials and equipment and support services in order to get the optimum output of resources. iii) Distance – A good layout will have minimum distances of men and materials for travel. This means that the total distance travel by the men and material should be minimized as much as possible. Further straight line movements should be preferred in a good layout. iv) Floor – In a good layout the floor is so arranged so as to have the material/finished products movement in forward direction towards the final stage. v) Coordination – A good layout ensures the entry into and disposal from any department in such manner that it is most convenient to the issuing or receiving departments. The layout should be considered as a whole. vi) Flexibility – There should be sufficient provision in a layout so that it becomes possible to modify the layout whenever the need arises. vii) Accessibility – In a good layout all servicing and maintenance points should be readily accessible. It should facilitate plant and equipment maintenance. For example; equipment should not be placed against a wall because necessary servicing or maintenance cannot be carried out easily. viii) Safety – In a good layout due consideration to industrial safety methods is necessary. It should provide safety not only to the work process but also to the men. Care must be taken not only of the persons operating the equipment, but also of the visitors to the plant. ix) Handling – A good layout should reduce the material handling to the minimum. Material handling affects time of operation and cost. Other basic principles based on which a good layout is made are as follows. It should have sufficient space to take care of future expansion. The need to provide acceptable working conditions for operators. In practice ideal conditions are not available always and some compromises need to be made. Hence always an optimum layout is made which meets most of the requirements of an ideal layout. For developing a proper layout a designer should have the following information. 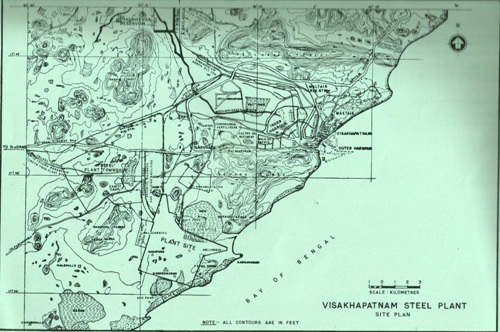 Site map showing external roads, neighborhood and Land boundary. A typical site map is shown in Fig.1. A layout (Typical shown in Fig.2) normally undergoes a series of revisions from the time it is first made and the last foundation is poured. Even so the ‘final layout’ is necessarily a compromise between the desire to fulfill the criteria given above and the limitations imposed by several other factors. But when the designer has had the conceptual vision to look beyond the present need and immediate difficulties then the resultant layout has the logic and flexibility as well as the capability to give much needed operational performance of the plant in spite of the changed conditions.